After months of speculation, the FBI made clear Monday that the Hillary Clinton private e-mail investigation is ongoing. 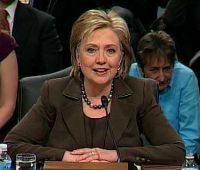 The letter, written by FBI general counsel James Baker, serves as a formal notice to the State Department that the case is under investigation, The Hill reports. Since last September, “in public statements and testimony, the Bureau has acknowledged generally that it is working on matters related to former Secretary Clinton’s use of a private e-mail server,” Baker wrote to the State Department. “The FBI has not, however, publicly acknowledged the specific focus, scope, or potential targets of any such proceedings. “Thus … we remain unable (to) provide (details about the case) without adversely affecting on-going law enforcement efforts,” he concluded. The FBI previously declined to officially confirm the investigation. The letter does not provide any details of the investigation. Posted: 2/9/16 at 9:13 AM under News Story.